The ANSI/ISA-TR88.00.02-2015 Machine and Unit States standard: An implementation example of ANSI/ISA-88.00.01 has been developed by the OMAC Packaging Workgroup and is known as PackML (Packaging Machine Language). PackML is for standardization within production and packaging facilities. It can be used to connect areas of equipment to one another easily and for them to communicate with one another – an important requirement for the Smart Factory. Manufacturing companies such as companies in the F&B industry, for example, are facing the challenge of a quickly-changing market. Products need an ever-shorter time to market. Ever-stronger networking and open communication interfaces allow smart system architectures. However, these can only be implemented if the individual production areas can communicate with one another without any problems. PackML provides standards that allow seamless communication. The equipment at the plant can operate with one another if PackML is used. This means that equipment from production and packaging processes can be combined easily. The status model is a central element of PackML. It helps to realize the implementation, operation, monitoring and analysis of a machine in a uniform manner. PackTags are used for the content of communication, regardless of the communication protocol. Soft PLC for the implementation of the status model, the PackTags and the necessary communication carried out by the production equipment on the basis of PackML. 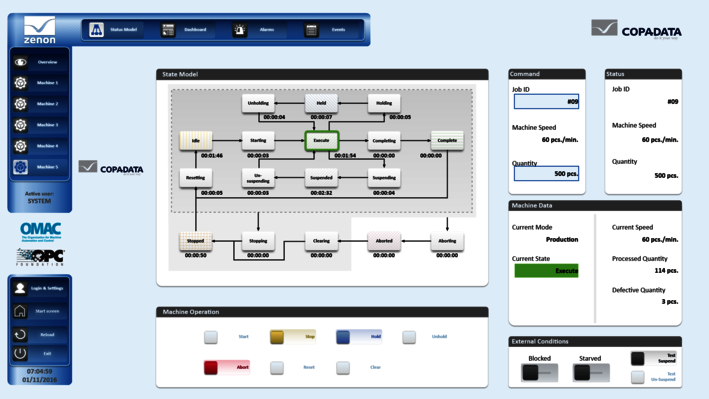 HMI (Human Machine Interface) that is connected to the PLC on the machine and communicates to another machine by means of a PackML interface. PackML gateway that is either integrated into the HMI or runs on separate hardware. Machines that are not PackML-compliant can thus communicate with other external systems, for example with further machines, other automation or IT systems, through to the cloud. Supervisory control system that communicates with PackML-compliant machines and/or other machines. In this example, zenon, as the supervisory control system, enables general monitoring and calculation of key performance figures in a heterogeneous plant with different PLCs. OPC UA has been chosen as the communication protocol for the PackTags. In addition, the key performance figures for this example are available on mobile devices in real-time dashboards. 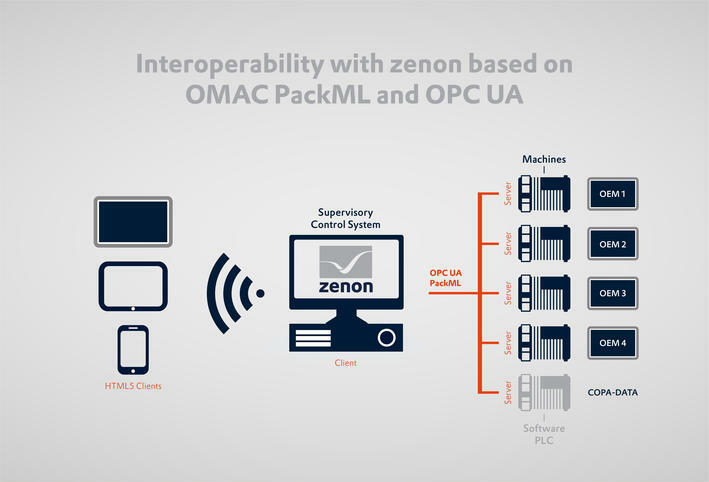 Such a system, with zenon as a higher-level supervisor control system, is characterized by excellent interoperability and is implemented quickly. It efficiently connects machines from different manufacturers into one complete system. Standardized communication and clear availability and assignment of any PackML-compatible machine offers major opportunities to increase efficiency in the engineering. 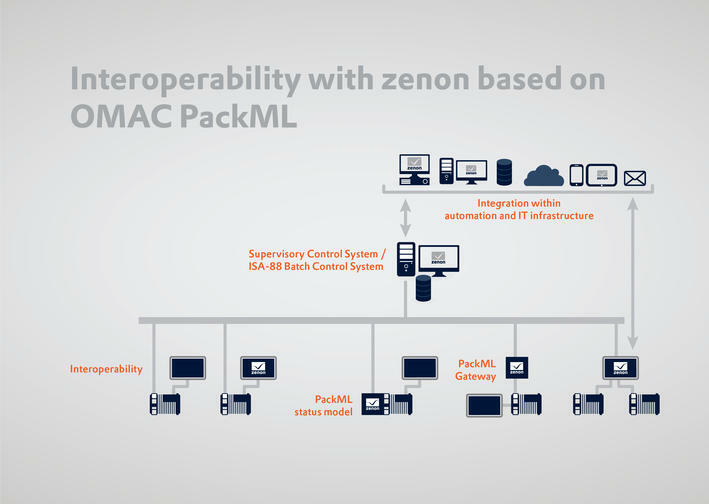 In addition to a high level of reusability of the application components, zenon offers an approach that is called automated engineering. For example, zenon applications can be generated with a zenon wizard, on the basis of PackTags and pre-standardized design templates, graphic symbols, language and terminology, dashboards, reports etc. The required flexibility of the finished application must be considered here, with regard to specific wizard parameters: the machines that are connected, which functionalities are required, communication configuration etc. The result is a massive saving of time for the engineering – a benefit of standardization that really pays off.